The demand for electric power over the course of a day varies greatly. It is influenced to a significant extent by the existing outside temperature, the light conditions and the usage practices. During the summer months, load peaks can be witnessed most frequently around noon when electric consumers are used extensively in private households or, to a minor extent, during lunch breaks in businesses. 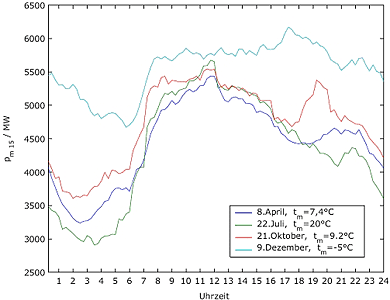 The illustration shows typical loads as they progress on weekdays (in this case, Wednesdays) throughout the different seasons of the year. For information on the date and the average daytime temperature, please refer to the illustration. The demand for electric power for cooling purposes can definitely also be observed during load peaks. This demand lets electrical distribution networks and power generation capacities reach the limits of their capacity with increased frequency. Indicative of this are the frequent "blackouts", power outages caused by line overloads, experienced in recent time including the ones in the USA on August 14, 2003 and Athens on July 12, 2005 . Less well-known since less dramatic in their effects are "brownouts". "Brownouts" are 10 to 15% voltage drops experienced in the electrical power supply over an extended period of time. These "brownouts" are, however, presumed to precede "blackouts". The use of chillers utilizing alternative operating power can reduce the load on distribution networks and help save power plant capacities. The data is based on mean values of electrical load demand recorded every 15 minutes (pm15) for a German public utility company during the period of May 1, 1998 to April 31, 1999. Progression of electrical load demand during workdays (Wednesdays) throughout the different seasons in Germany.